Preheat a medium high grill. Cook the bacon rashers in a non-stick frying pan until crispy. Remove from the pan with a draining spoon and set aside on kitchen paper. Add the mushrooms to the frying pan and cook them in the bacon fat for 2-3 minutes. At the same time, toast the split panini, cut sides up, under the grill. Spread the cut sides with a little mustard (if using). 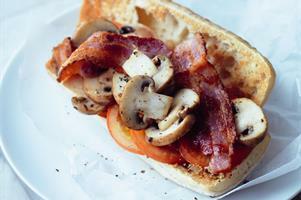 Share the tomatoes between the panini and top each one with 2 bacon rashers and the mushrooms. Season with ground black pepper and serve at once.